Gianfranco is 18 years old and just completed his senior year in the St. Anthony Program at Bishop Canevin High School. He lives in the Friendship/Bloomfield neighborhood of the City of Pittsburgh with his parents Dorothy and Carlo. They are parishioners at St. Maria Goretti. Gianfranco entered the St. Anthony School Program with Kindergarten at Word of God. He completed elementary school classes by also attending Cardinal Wright and St. Mary of the Assumption. In the fall, he will begin his first year in the Post-Secondary Program at Duquesne University. Since the age of 9, Gianfranco has been competitively swimming. 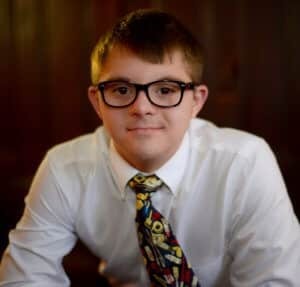 First with the JCC Special Olympics swim team, where he won various gold and silver medals; with Team Pitt aquatic club; and the past four years with Bishop Canevin/Carlynton Varsity Swim team, where he has earned 4 varsity letters. His other interests include basketball, listening and singing along to a variety of music and has played the piano since second grade. He is currently anticipating going to the prom and graduating with the 2017 Bishop Canevin High School Class. In the fall Gianfranco will attend the postgraduate program at Duquesne University with the goal of expanding his knowledge and skills to live independently, get a job, learn to drive, get a driver's license, and buy a car.